Here in New Jersey, Spring is in the air and the sun is finally shining! Our temps are suppose to reach 70° degrees today. Daffodils and crocuses are popping their heads through the soil. I am dressed and ready to take a long morning walk. This is a day I would love to spend outside but, I have a dessert to bake for a dinner I am going to tomorrow night. However, it's Friday and that means this post belongs to Dorie. I made the "Salted Butter Break-Ups" last night after dinner. I was quite surprised at how fast this recipe was to prepare. 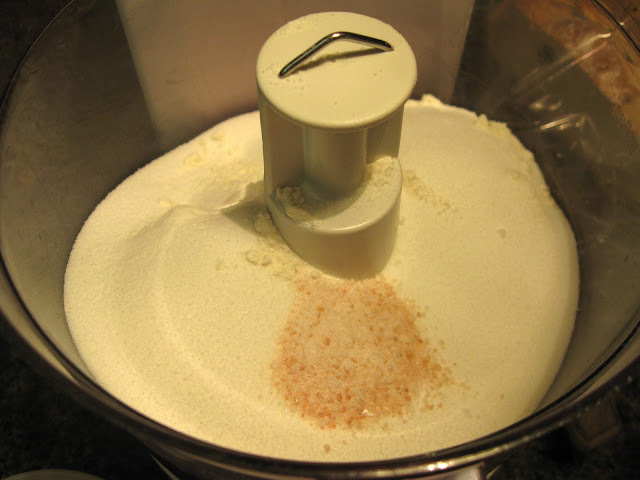 I put the flour, sugar and salt into my food processor. I did not have the "Sel Gris" that Dorie suggests. Salt is salt; except for the coarseness of the grain. I had kosher salt and I had a Himalayan Pink salt, that came with a grinder from Trader Joe's. Ok, I was taken by the pretty pink color…it still tastes like salt! I opted to use the pink salt. I then added the butter to the processor and processed until it was well blended and started to look like coarse corn meal. Then I added the water. When the dough started to form a ball, I took it out and worked it to form a square. I then wrapped it and refrigerated it for an hour. It was still a bit soft when I took it out but, I rolled it anyway. Everything was going well until I tried to put the design on it with the fork! The dough was too soft. So I put the rolled dough on the baking pan and put it into the freezer. After 20 minutes, I took it out. I was then able to put the design onto the dough with a fork. It worked really well! I was not excited about trying this recipe. I think it was the name! Too much salt! But when I awakened this morning, I saw it sitting on my counter and had to break a piece off. I was totally in love with this cookie (that's what it is.. a cookie)! I will definitely make this again…loved it! Ready to go into the oven with pretty design. This recipe can be found in the new Dorie Greenspan book "Around My French Table". You can buy this book at Amazon. Cooking with the FFWD group we are asked not to publish the recipes but this recipe has been published already and you can find it HERE! You are so smart! I tried to use a cooling rack to do my design, but the dough was too "wet" and it just stuck to the rack. Wish I'd thought of sticking it in the freezer for a bit. Your first photo is perfect! Wow, Kathy! Your design is perfect! I had to laught at your comment to Trevor about keeping cookie dough in the refrigerator for 48 hours - I'm afraid there would be none left to make cookies with after that long! LOL! Enjoy your weekend! That pink salt is really cute! When I made this, I thought I had to keep lifting my fork to make the hatches until I realized I could just light drag it! Ha! At least I figured it out. Your cookie looks great! Yours is so pretty and golden, Kathy! I am so glad that Spring has finally arrived there and you are wanting to be outside. I will just have to go get some pink salt - it's so pretty. Bravo! And glad you were able to make everything work. Can you send some of your spring up North a couple hundred miles? Pretty please! You got the crosshatching perfect! And mine photographed yellow, too...tried to lighten it, but think mine are a little pale :) Hope our scallops aren't yellow next week! You cookie looks perfect! I love trader joes salt grinders too! Yours looks lovely - I too bought the pink salt for its color - I couldn't resist! Looks great! Did the pink salt turn the cookies pink at all? To all of you, thanks for your lovely comments. @ CAM-I too like to nibble on cookie dough. @Cher-I wish I could send it to you but unfortunately for us it gets cold again tomorrow. Today was gorgeous! @Lizzy-I can't wait till we do the scallops..they look so good. @Betsy-The cookie dough had little pink flecks in it before it was baked. Thanks again to all for visiting…I do enjoy reading all your posts! I need to find a grinder for my pink salt. I tried crushing it in the mortar and pestle but got kind of carried away! Your cookie looks perfect and so tasty. I am a new convert as far as salt in desserts is concerned, and I am looking forward to experimenting some more. I love pink Himalayan salt - it's so pretty. I have that same NYT article and blogged the cookie options long ago. Chillin' works! I just realized that I used the whole egg in my egg wash. I don't know if that changed the final color or not but the tone was quite appealing. Glad you enjoyed this one - the pink salt is so fun! I'll have to look for some of that cute pink salt next time i'm at TJ's.